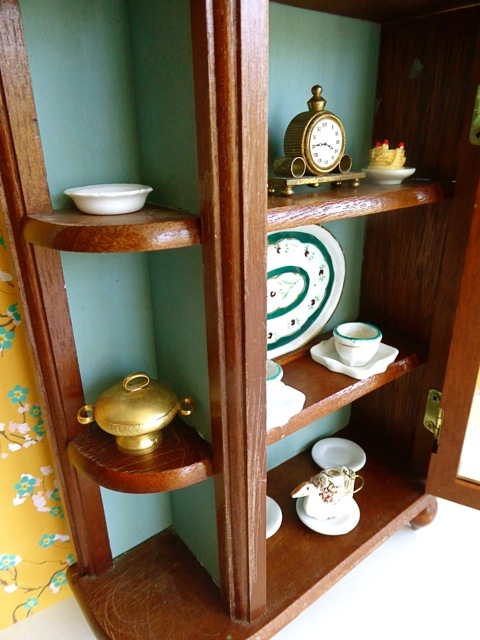 CHINA CUPBOARD: A very solid hardwood piece, perfect for displaying a multitude of brass and china accessories. It’s in great vintage condition and features three shelves and a central door with real glass (so please take care with the piece and avoid letting very small children play with it). On the top shelf inside sits a lovely brass clock (non-working), two cakes on china plates; on the middle shelf is a beautiful hand-painted china platter and two green-rimmed antique tea cups resting on china plates, while on the bottom shelf is the most wonderfully eccentric teapot in the shape of a goose (!) plus three white china plates. Accessories on the side shelves include ceramic basket for holing the four place“golden” cutlery – three pieces are on the table. There’s also a brass serving dish and a brass bell – for summoning children to tea perhaps? TABLE AND CHAIRS: A stunning, antique set featuring its original paintwork, handmade in the early years of the twentieth century we believe. This is a really unusual set with it’s curving chair and bench backs, their “gilded” accents and the matching circular table with charmingly curved legs. 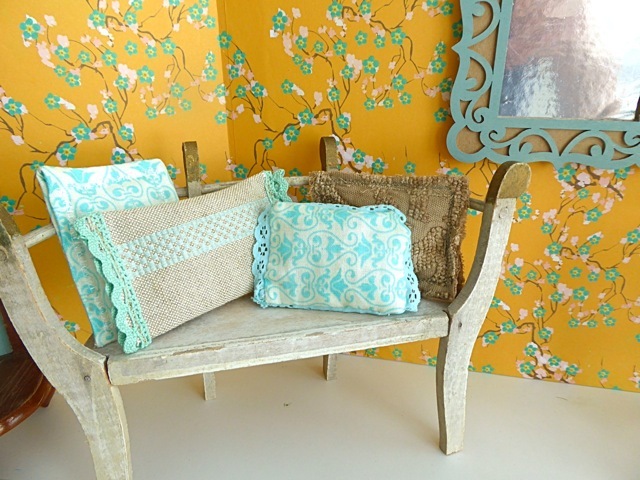 On the chairs and bench are four handmade cushions. The table is set for afternoon tea with an antique milk jug, sugar bowl, vase of ivy and gorgeous, solid brass lamp and shade. 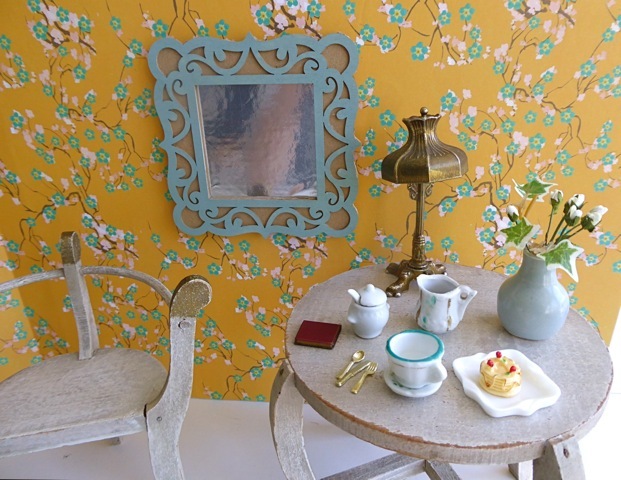 MIRROR: A sinuous, laser-cut wooden mirror, painted to go with the wallpaper. WALLS:Covered in thick, Chinese-inspired wrapping paper. The paper has been mounted on two pieces of 5mm thick, A3 foam board. Each piece of foam board measures 42x29.5cm or 11 5/8 x 16 3/8in. DOLLS: Chosen from our selection of vintage dolls, but please see the DOLLS section of our website, www.ggmdolly.com for a larger choice. Shown here: a beautiful, dark blonde Revlon Toni doll wearing a stunning, lace-trimmed handmade evening dress. Note that we have lots of other clothes available for this doll.